"Demetrios" - Pastel - 12" x 10"
"Refugee" - Pastel - 20" x 16"
"Treasures From The Past" - Pastel - 8" x 11"
I have been interested in painting since I was a little girl and used to draw on every piece of paper that I could find. My busy schedule as a wife and mother of two boys kept me from pursuing my dream until 2006. I am a pastelist by preference and I loved this medium from the moment I picked up my first pastel in 2009. It is a magical medium that reflects light in such way that the painting's surface emits a glow. I am mainly a still life painter but I also enjoy portraiture. I respond to what catches my eyes and heart by using color. I am constantly obsessed by colors and I find myself spellbound by the play of light while it strikes objects and creates luminous reflections. I enjoy depicting the movement and illusion of water. Pebbles, glass marbles, shells, toys are my favorite subjects. As an artist I feel an irresistible attraction towards realism. My passion is in the details. I love painting close-ups and my need to depict the chosen subject with great precision seduces me into a constant battle to master new skills of realism. Irene Georgopoulou was born in 1964. Since becoming a full-time artist in 2009 she has won several awards and her work has been published in art books and magazines, most notably: PoetsArtists, International Artist Magazine, Artist’s Magazine, Southwest Art Magazine, Pastel Journal, and a series of Strokes of Genius books. She is a Signature Member of the Pastel Society of America, member of the Pastel Society of the West Coast, of International Guild of Realism and has achieved Master Circle Status with International Association of Pastel Societies. Irene paints realistic still lifes and portraits in pastel. She is a collector of objects that stimulate her creativity and she loves transforming common objects into luminous still life paintings. She also finds portraiture fascinating and tries to create a certain emotional content with her work. 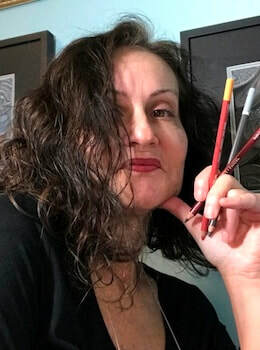 Her work has juried into art shows such as IGOR, IAPS and Pastel Journal's Pastel 100 and she was among the finalists in many art competitions. Some of them are International Artist Magazine Competition, Southwest Art Magazine Artistic Excellence, Artist Magazine Annual Art Competition and Richeson75. She has participated in numerous exhibitions in USA, , Italy, France, China, Greece and Turkey. Irene’s art is in many private collections worldwide. 2011. Still Life and Abstract Exhibition at Richeson Gallery in Wisconsin, USA. 2011. IAPS 18th Juried Exhibition at the Hispanic Arts Gallery Expo New Mexico in Albuquerque, New Mexico, USA. 2013. Small Works at Richeson Gallery in Wisconsin, USA. 2015. Small Works at Richeson Gallery in Wisconsin, USA. 2015. International Art Exhibition “Insan Insterse” in Istanbul, Turkey. 2015. IAPS 26th Juried Exhibition in Albuquerque, New Mexico, USA. 2016. 2nd China (Suzhou) Biennial International Pastel Exhibition at Ming Gallery, Suzhou, China. 2016. Small Works at Ena Gallery in Athens, Greece. 2017. Energy Athens hosted by the European Centre for Architecture Art Design and Urban Studies in Athens, Greece. 2017. “Welcoming Documenta 14” at Kaplanon5 Gallery in Athens, Greece. 2017. First International Exhibition of Pastel Painting in Tivoli, Italy. 2017. 2nd Art Thessaloniki International Art Fair, Thessaloniki, Greece with Kaplanon Galleries. 2017. Art Exhibition “Find Refuge in Art” project of the Hellenic Open University in Athens, Greece. 2017. “Keys” selected for the Pastel Art Museum Opening Exhibition in Suzhou, China. 2018. Small Works at Richeson Gallery in Wisconsin, USA. 2018. 3rd Pastel d'Opale, Boulogne sur mer, France. 2018. "Monografies" at Ena Gallery in Athens Greece. 2018. Pastels On High Open International Exhibition at Sacramento Fine Arts Center in Carmichael, California, USA. 2018. 13th Annual International Guild of Realism Exhibition at Sugarman-Peterson Galleri in Santa Fe, New Mexico, USA. 2011. “Pebbles” won the 1st Award in Richeson75 Still Life & Abstract Competition. 2015. “Spoons” received the Award of Merit in Four Points Contemporary International Competition. 2015. “Keys” won the People’s Choice Award in Richeson75 Still Life & Floral Competition. 2015. “Washed Ashore” won 4rth place in the Still Life/Floral category of the 17th Annual Pastel 100 Competition. ​2015. “Three Orchids” won the Richeson75 Still Life & Floral People’s Choice Award. 2017. “Refuge” awarded Outstanding Pastel in the August BoldBrush Painting Competition. 2017. “Innocent Smile” won 3rd place in category 34-Realism/Humans at American Art Awards. 2017. “Still Life With Boots” won 5th place-tie in category 37-Realism/Still Life at American Art Awards. 2019. “Shipwreck” II won the 1st place in category Still Life at 1st PASIT (Pastellisti Italiani) online competition-exhibition. "Love Boat" - Pastel - 9"x 12"
"Would you play with me?" - Pastel - 11" x 13"